All couples fight—it is a natural part of life and relationships. Even if we don’t want to admit it, most of us get into relationship spats at one time or another. There is nothing wrong with the occasional disagreement between couples, but it is important to mend what you can while it is still fresh. If you have upset your boyfriend, here are a few steps to apologize to your boyfriend and mend the relationship. Being clear and direct in whatever the issue was (and whatever your excuse or apology is for that particular issue) is the best route to take take if you want to apologize to your boyfriend. Making amends with your partner only strengthens the bond. Yes, apologies can be hard, but they are almost always necessary. If you speak clearly and let your partner know what and why you felt the way you did (or what and why you acted the way you did), chances are the problem will be solved in a quicker way. It seems simple, but apologizing is the best way to, well, apologize. Oftentimes, we forget to actually say the words, “I’m sorry” when we are apologizing. It is human nature to be relatively stubborn, but perhaps that is why the words “I am sorry” go so far. When you apologize to your boyfriend, try actually telling your boyfriend that you are sorry and go from there. Again, it is human nature to be stubborn. If you did something to upset your boyfriend, it might be hard to remember that an explanation might be helpful. If you explain yourself and your actions, you might have a better chance of forging a stronger union. Explanations can go a very long way. 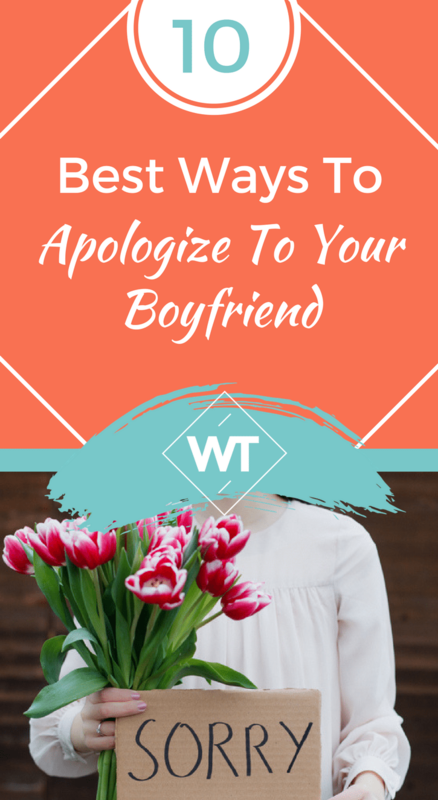 Let your boyfriend know that you are sorry and things will smooth themselves out quickly. A huge part of how to apologize to your boyfriend is listening to the other side. Sure, you are sorry, but what about what he has to say? Listening is the next step toward clarity. Are you sure you are aware of why he was upset in the first place? Listening to what your partner has to say can be as healing and helpful as speaking your own part. Apologies are important—as is communication—however, some people work best with time. Though some of us, as human beings, can accept apologies and move on, some of us cannot. Letting time pass (and letting time heal us) can be the most important and effective way for certain people to move on. Maybe your boyfriend isn’t the kind of person who appreciates a gift, or maybe he is. Either way, making amends in a more physical form is a great way to apologize. Does your boyfriend love your local sports team? Pick up tickets to the next game, or treat him to his favorite player’s jersey. Does your boyfriend love gardening, or going to the movies? Buy him a new gardening book, or some new bulbs, or movie tickets. Whatever your partner is into, buying him a gift or making a gesture to acknowledge that those things are important to him is a great way to apologize to your boyfriend (or to continue to apologize). Social media is not for everyone, but believe it or not, it is here to stay. Whatever the situation is between you and your partner, expressing yourself on social media is a great way to remind him that you love him and are there for him. There is no need to include the apology in your social media post, but just expressing the fact that you are happy to be with him is enough. Another simple gesture, but another powerful one. We all love to receive a simple “I love you” or “good night” or “good morning” text message, right? If you and your boyfriend are going through a hard time, why not send him a text message to remind him that you love him and why you love him and how much you appreciate him. One of the most effective ways to apologize to your boyfriend is to own up to your mistakes. Whatever occurred for you to need to apologize, owning up to it is super important. If you clearly state that you are sorry for whatever you did, and explain why you did it, and apologize for it, and completely admit your part in the situation, your boyfriend will be able to move past it. No one wants an apology that doesn’t really mean anything. Your boyfriend will appreciate an apology if it is genuine, and not if it is just because you feel obligated to say that you are sorry. Apologizing is one thing—being genuinely sorry is another. Apologizing can be hard for all of us, especially the people who tend to be more on the stubborn side. If you follow the above steps, you can apologize to your boyfriend and it will be effortless and effective. 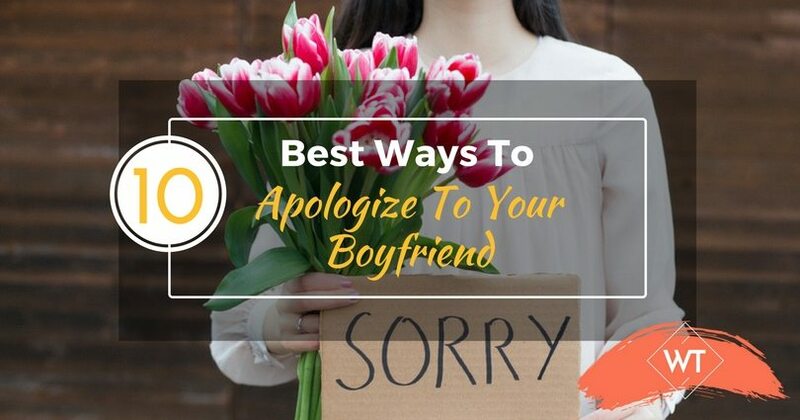 Read our other article if you are looking for tips to apologize to your girlfriend. Good luck!